From the ICMAB, Andrés Gómez and Jaume Gázquez are co-authors of the study, which has been done in the framework of the NFFA-Europe project, among others, being benefitted from the access provided by ICMAB-CSIC to Adrián Carretero-Genevrier, from the Institut d’Électronique et des Systèmes (IES), CNRS – Université de Montpellier (France). The authors of the cover are Andrés Gómez, Adrián Carretero-Genevrier and José M. Vila-Fungueriño. 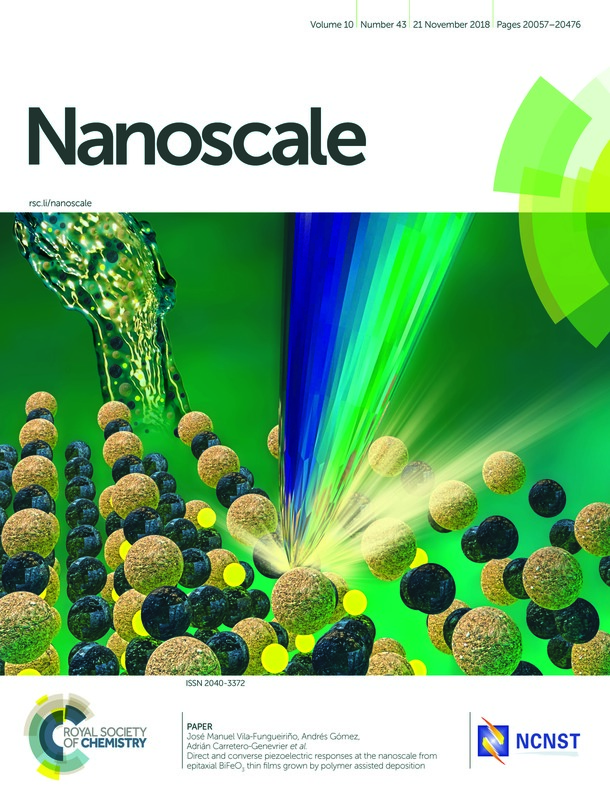 The cover wants to illustrate that the BiFeO3 thin films have been grown by a water-based chemical method, and that their piezoelectric properties at the nanoscale were measured using standard piezoelectric force microscopy (PFM) and piezo-generated charge maps obtained from a direct PFM approach. The work demonstrates the potential of combining soft chemical synthesis and novel characterization tools for the development of advanced functional piezoelectric devices. Abstract: We use an original water-based chemical method, to grow pure epitaxial BiFeO3 (BFO) ultra-thin films with excellent piezoelectric properties. Particularly, we show that this novel chemical route produces a higher natural ferroelectric domain size distribution and coercive field compared to similar BFO films grown by physical methods. Moreover, we measured the d33 piezoelectric coefficient of 60 nm thick BFO films with a direct approach, using Direct Piezoelectric Force Microscopy (DPFM). As a result, first piezo-generated charge maps of a very thin BFO layer were obtained applying this novel technology.We also performed a comparative study of the d33 coefficients between standard PFM analysis and the DPFM microscopy showing similar values i.e. 17 pm/V and 22 pC/N respectively. Finally, we proved that the directionality of the piezoelectric effect in BFO ferroelectric thin films is preserved at low thickness dimensions demonstrating the potential of chemical processes for the development of low cost functional ferroelectric and piezoelectric devices.